Awaken to a ruined Hope County, Montana in the upcoming open world action game Far Cry: New Dawn, which is launching on Febraury 15th. Learn more about the story and gameplay features while you wait. Set 17 years after the terrible nuclear catastrophe that struck Hope County, it'll be up to you to emerge from the ashes to face the highwaymen and their leaders, the Twins. Fight for survival in this dangerous post-apocalyptic world, form alliances and build deadly weapons to combat the rising threat. Find out more about the story for Far Cry: New Dawn with the brand new story trailer while you wait for release. Additionally, another video gives us a proper look at the gameplay features coming to the game. While the game is set in the same location as Far Cry 5, the world has changed considerably by Fire and Radiation, which has effected not only the plants but also the wildlife. Nothing you remember will be the same as you explore this changed world. Scavengers known as the Highwaymen rule the county by setting out outposts and it'll be up to you to put a stop to them by any means necessary. Not only has the landscape changed, but the way you move around it and the weapons you'll get will also be different. Build up your home base at prosperity, a settlement made up of survivors and work together to bring order to the chaos. Expect Guns for Hire to make a return, including some old favourites who lend aid to the player in their hour of need. You can even hire specialists who will use their skills to upgrade your home base facilities to allow for more upgrades, better gear, new fast travel options and more. Both weapons and vehicles come with ranks this time around, and upgrading your workbench will allow for even more powerful tools of the trade. Higher ranked weapons will not only include more damage, but also extra options such as scopes, silencers and more. Work with the remnants of the project at Eden's Gate, who will team up with you to hunt the Highwaymen. Far Cry: New Dawn launches on February 15th 2019. 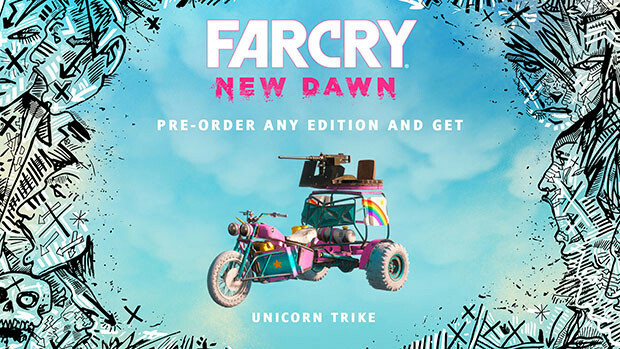 You can pre-order the game to get the Unicorn Trike skin for free!